FERC staff last week issued deficiency letters to all six jurisdictional RTOs and ISOs over their proposed energy storage rules, pressing for definitions, tariff citations and details on issues including metering, make-whole payments, and self-scheduling. This Washington Examiner story by a reporter who joined AEE’s EV press tour at the Washington Auto Show covers the market drivers and future of EVs in the U.S. and explains how automakers plan to produce them despite President Trump’s proposed fuel standards rollback. The piece notes EPA Administrator Wheeler's remarks at the show and includes perspective by AEE Managing Director Matt Stanberry. See excerpts below and the entire Washington Examiner story here. This story was also covered by E&E News here and the Houston Chronicle here. 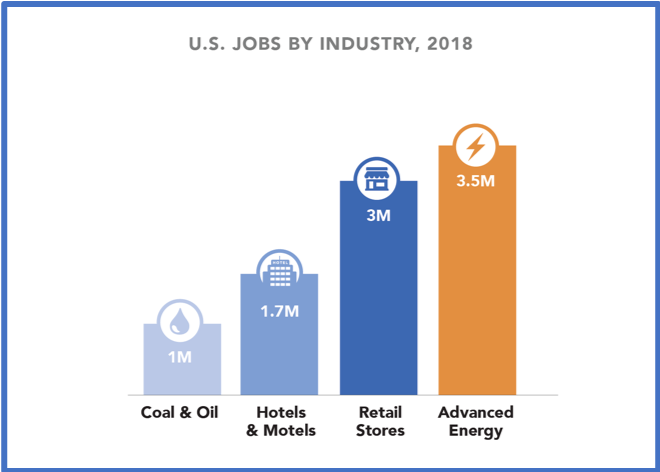 WASHINGTON, D.C., March 20, 2019 – Today national business group Advanced Energy Economy released a fact sheet showing that the advanced energy industry employed 3.5 million U.S. workers in 2018, an increase of 125,000 jobs over 2017. Advanced energy employment grew 4 percent year-over-year, more than twice as fast as the overall U.S. employment growth rate of 1.5 percent. Employers expect to add 6 percent more advanced energy jobs in the coming year. Governing Magazine covers how cities large and small (and several states) are stepping up their efforts to combat climate change and cope with its impact. The authors cite the economic benefits of the advanced energy economy, specifically referencing AEE's half million jobs figure for California as a tangible example. See the entire Governing article here. Read the entire Governing article here.